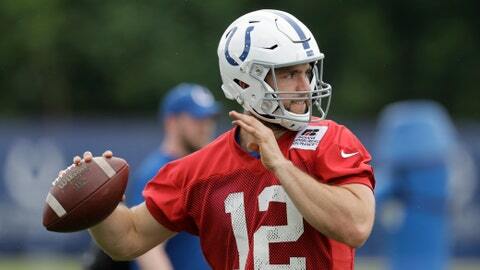 Andrew Luck says he's nervous but excited about his first game action in more than 19 months. WESTFIELD, Ind. — Andrew Luck spent two straight offseasons contemplating how it would feel to play football again. Coach Frank Reich announced Tuesday that Luck would start and could play most of the first quarter in the Indianapolis Colts’ preseason opener at Seattle. There’s a new general manager and a new coach in town. Another new offense has been installed, and Luck is still trying to learn everybody’s names. Even the once formidable offense has undergone a major revamp. Rookie Quenton Nelson and free agent signee Matt Slauson have moved in as the new starting guards. Tight end Eric Ebron and receiver Ryan Grant are promising new targets for Luck, who will be handing off to second-year running back Marlon Mack for the first time in a game Thursday. Indy expected Luck to return last season, but he didn’t start throwing until early October and was shut down two weeks later after complaining of more pain. He went on injured reserve in November and didn’t resume throwing footballs again until May. And now, finally, Luck appears ready to take the next big step in his recovery, even if he plays only a couple of series.